Jim Murray and Pete Mason play the blues. They play tunes of the Dust Bowl and its old timey forebears; an Appalachian folk tune, a Cajun jig, a Deep South gumbo. Shieldsmen Murray and Mason do it with panache, it’s as though they aren’t trying. They’re students of the genre, they’ve played the music for years, they’ve got the patter and an in-the-head set list as long as a ‘gator in the Mississippi. Between sets the Red Arrows screamed overhead heading north east, then, banking left in formation, swooped low to Newcastle International Airport, their base prior to an evening appointment down the coast at Sunderland International Air Show. Bizarrely, some Sage rednecks burst into a round of applause. A long queue formed at the pop-up bar of one of the region’s micro breweries (a pint in a plastic glass at £4.00.). A neighbouring stall did its best to entice the hordes with the offer of burger, fries and soda – yours for £8.00. The under-unoccupied burger flipper had plenty of time to listen to the music. 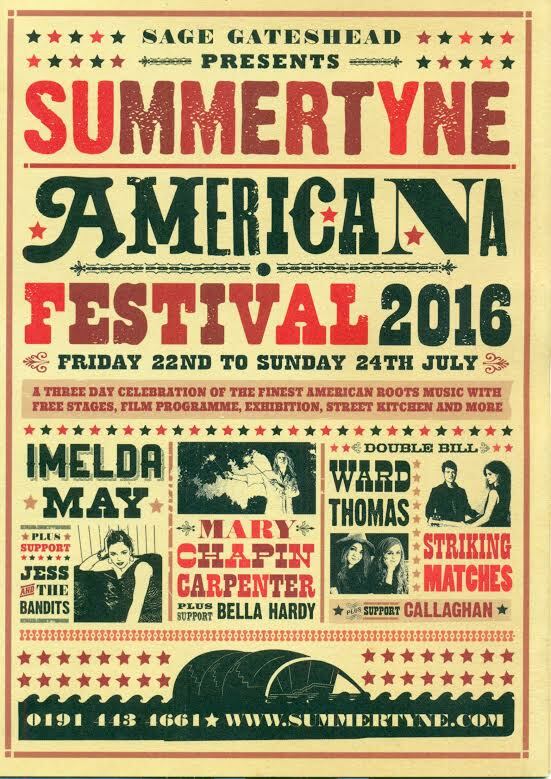 A couple of years ago Teresa Watson went along to Summertyne Americana as a punter. A lady in self-imposed retirement, Watson decided she would like to be up there on stage – the roar of the greasepaint and smell of the crowd, and all that – and now in 2016, here she was, belting out the blues once more. Reunited with some of the best bluesmen on the scene, Watson was delighted to play ‘this little festival’. Our vocalist’s joined-at-the-hip bass and drums team – John Morgan and Barry Race – laid the foundations for a Johnny Whitehill guitar master class. The Northumbrian doesn’t strike a pose, his vintage Gibson Les Paul does the talking. Peter Green an obvious influence, referencing Chicago heroes, Whitehill’s encyclopedic knowledge of the genre makes him a guitarist’s guitarist. Teresa Watson is a Love Me Like a Man woman, happiest when she is telling you how it was and how it could be, the lot of a blues woman. Americana at Sage Gateshead is an occasion. Outdoor, in door – on the concourse and in the halls – you’re never more than a few paces from bumping into a dude with a Stetson. Do take time to view the photographic exhibition outside Sage One and Sage Two. Sage in association with Amber is showing The Preacher and his Congregation. Side Gallery across the river in Newcastle is currently closed for major renovation works. Americana has taken the opportunity to loan James Perry Walker’s photographs of Reverend Louis Cole and his congregation shot on location in 1970s rural Mississippi and Tennessee. The Newcastle gallery reopens on October 1st, this Gateshead exhibition is a rare opportunity to view an important part of the documentary collection before it is returned to the vaults.